Potfest in the Pens took place in Penrith over the weekend. I went on Saturday and, nothwithstanding the torrential rain that fell all day, it was an exciting and inspiring day out. What affected me most about the day was discovering a potential community of like-minded people, over 100 potters were exhibiting, with everyone passionate and enthusiastic about their craft. It was a warm, friendly and supportive event and potters were keen to talk and offer advice. 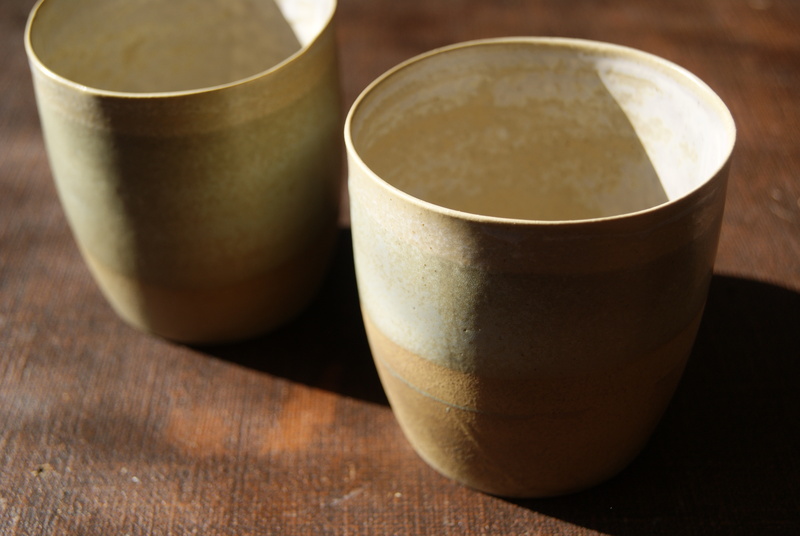 I bought these two beakers from Sue West, who is based in Windermere, which are so fine and delicate. They are slip cast stoneware, thin as egg shell, and she uses the form, primarily, as an object upon which she can work the surface. They are lovely to hold and a pleasure to drink from. The outcome from that day that I am most pleased about is that I met a potter who has agreed to teach me, initially for a day but with the potential to be an on-going arrangement. 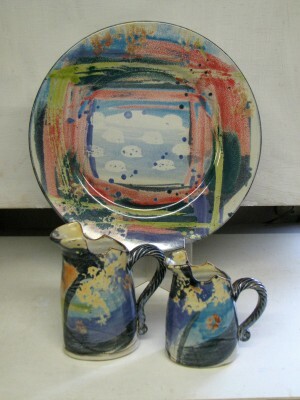 His name is David White and he creates these fantastically expressive, painterly, earthernware pieces. I know I wrote in the last blog post about the value of working things out for oneself but there are elements of the pottery process that I have no knowledge of and would benefit enormously from his considerable experience. On my way back from Potfest, I stopped in the book town of Sedbergh, where I found the most amazing book, published in 1959. 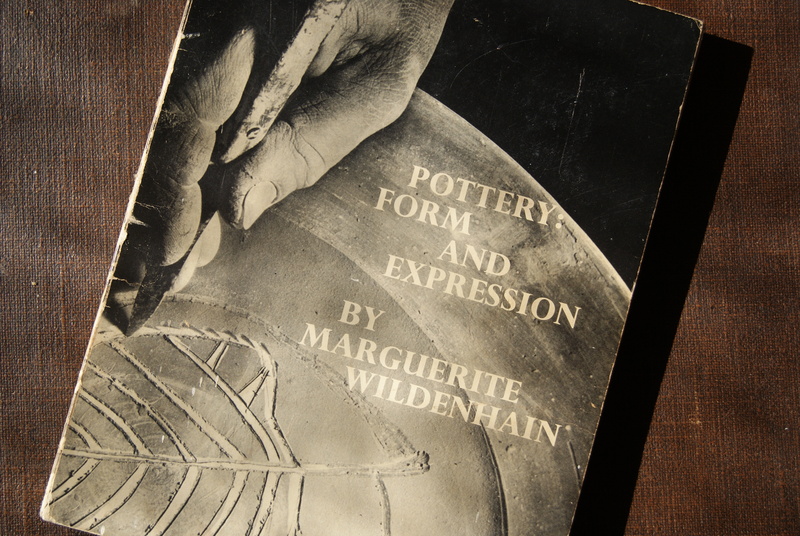 In the book, Marguerite Wildenhain talks about “something that [a student] gets in the daily contact with a man who has worked and concentrated all his energies in that one special field he has chosen as his life’s work. The daily interchange of ideas, of experience, of thought, the common interest of student and teacher in the solving of the recurring difficulties of their profession…” I’m looking forward to my time in David White’s studio. 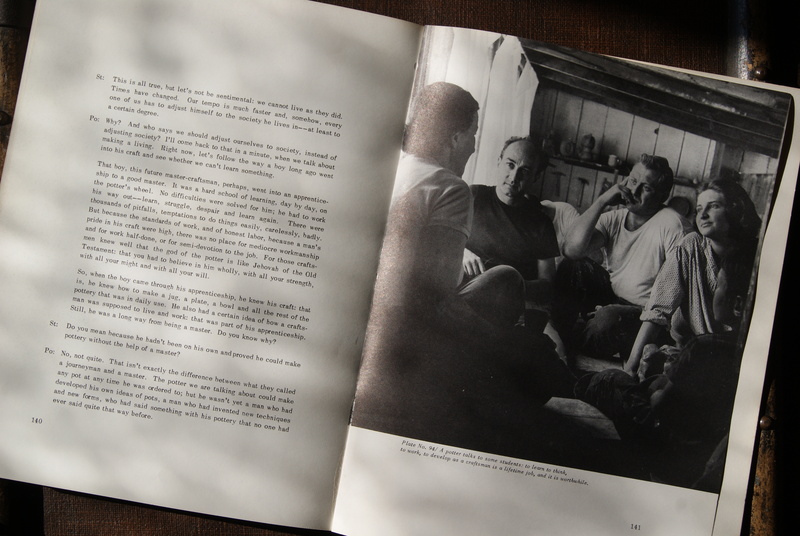 One of the last photographs in the book has the caption: “to learn to think, to work, to develop as a craftsman is a lifetime job, and it is worthwhile”. It has been a thought-provoking couple of weeks. My workshop is up and running, as far as throwing is concerned, and is functioning well, and I love being in my cellar. I have no clock, telephone or radio down there. I weigh out my balls of clay, set them up on the edge of my wheel and throw. Before I got the wheel, I didn’t know how I would take to the discipline, routine and rhythm of being at the wheel, how I would react when the process of learning became frustrating and hard. The process of teaching yourself is hard, and frustrating; I have certainly found it so these past couple of weeks. I have been working on the same form, the beaker, trying to get it right. 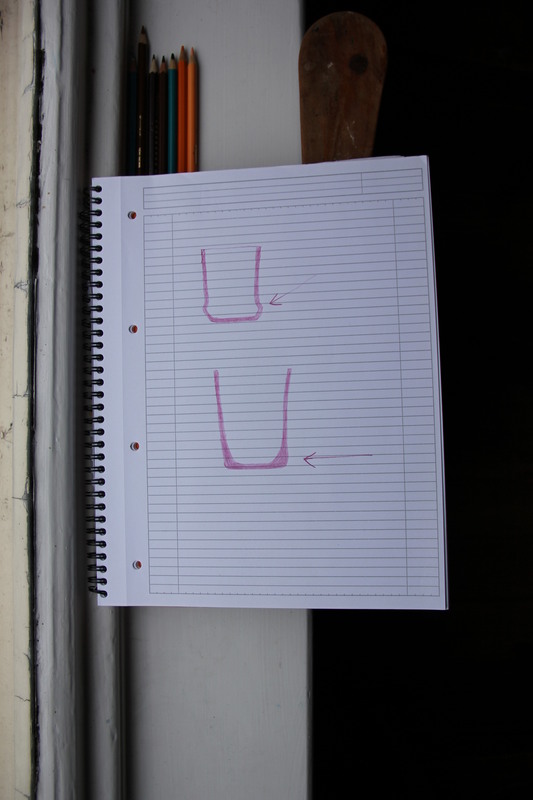 It is a simple looking form but deceptively so. The issues came because I kept making the same mistakes over and over again. This is what I mean about teaching yourself. A little look over my shoulder by someone with experience would, I’m sure, have remedied the mistakes in no time. I spent days with the same weight of clay, throwing repeatedly and each time the same mistakes would arise. The main issue, the top drawing in this picture, which I just couldn’t seem to fix, was the bulging walls at the bottom of the beaker. It happened every single time, day after day. I cut each one in half trying to work out what was going wrong. It meant that I worked and worked each form until I killed it. I spent several hours watching clips of people throwing on youtube; and that, as always, was a big help. I tried different ways of pulling (for example, keeping my inside finger still inside the pot and pulling the outside finger up it. This kind of worked but I knew it wasn’t the correct way of doing it. ), different ways of opening up the centred clay, until I began to find something that worked. All the time I could see that there were very small improvements but I kept making the same mistakes. 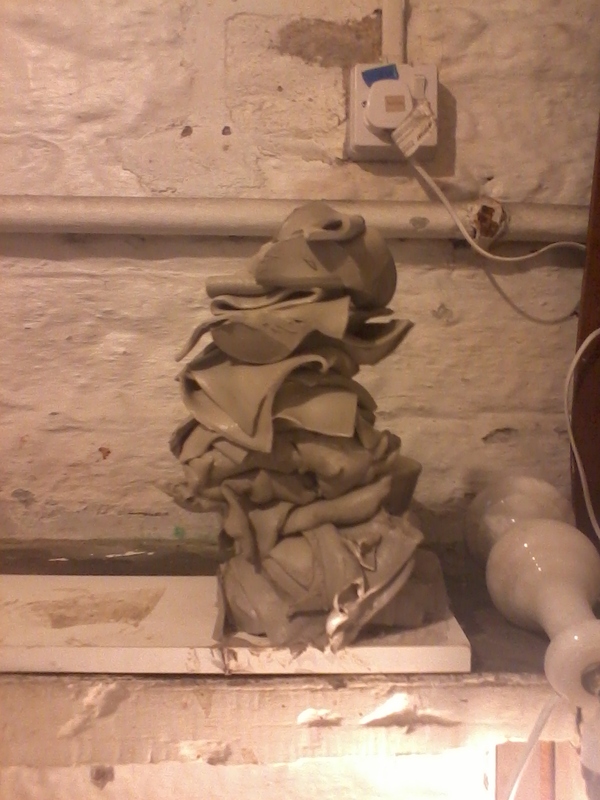 Today, though, it began to come together and of the 30 balls of clay that I threw not one of them bulged at the bottom. The problem was in the end so simple: I was pulling out at the bottom and not up. I thought I was pulling up but I wasn’t. This is a major triumph! I also managed to get rid of the excess clay in the bottom corners and pull it up without ruining the form. 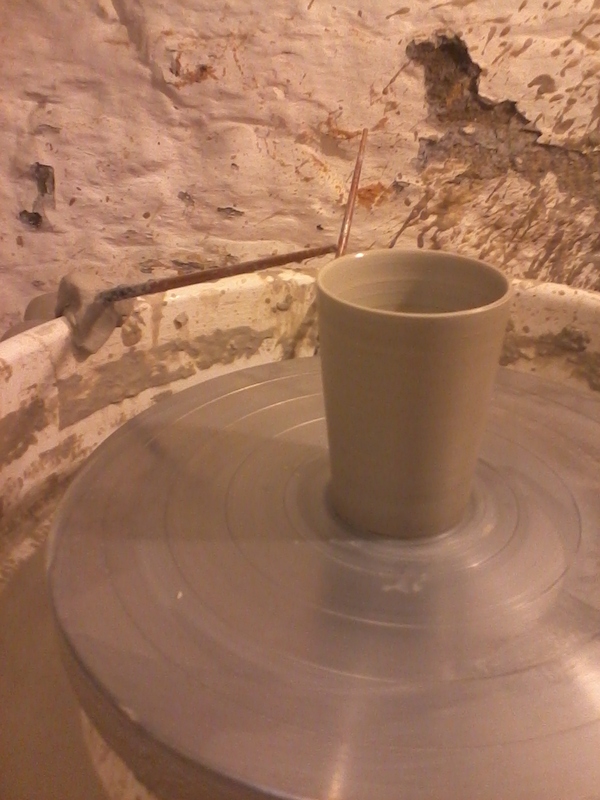 And, with the last one of the day, I even managed to throw it to a gauge (I put the gauge up three beakers previously). There is a lot to be said for teaching yourself, for having to work out a problem, for having to persevere. I have learnt a tremendous amount that I wouldn’t have learnt if someone had simply told me how to do it. There is a thrill in struggling with something and eventually being able to find a way through; I certainly felt that thrill when that last beaker came up to the gauge. You are currently viewing the archives for August, 2011 at The Hopeful Potter.